So, you’ve got the green light on your project, you need underwater filming, you’ve come to Scarlet View Media to help you get the shots you need and you’re aware of your legal obligations when hiring a Dive Team for your production… So far, you’ve done everything right but there are a few things you may not have considered which you certainly should, if you don’t, it could mean what should be an award winning sequence or film, actually turns out to be an unmitigated disaster! Here are just a few of the things you may not have thought about in regards to your production, don’t worry if you haven’t, that’s what we’re here for! So you need a short sequence of Great White Sharks for your film, you’ve already confirmed South Africa as the location and you want to parachute in for three days to get what you need but upon arrival, it’s blowing a gale, the captain refuses to take you out and you return empty handed. It happens to the best of us, in fact, it’s incredibly rare that one of our productions passes without an impact from adverse weather conditions however, we never return empty handed due to the fact we plan for this and know if we can get what we want in three days, we’ll probably need seven to be on the safe side and to compensate for the lost days we will almost inevitably experience! Incredible wildlife Cinematography is worth its weight in gold but unfortunately, wildlife does not take direction well! 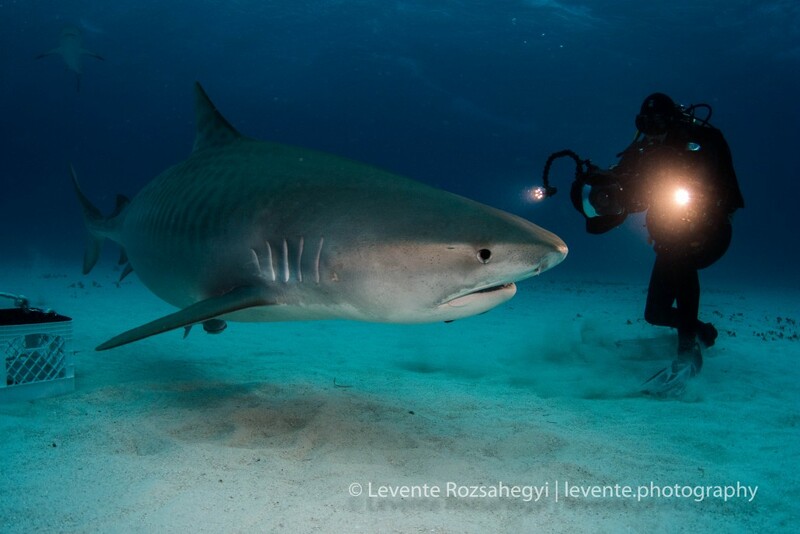 You have five days in The Bahamas to film Tiger Sharks at Tiger Beach, it’s easy, you turn up, the sharks turn up and you get your shots right? Well, not always, what if the sharks don’t turn up, or, when they do, they simply will not do the things you want them to do? For example, you want shots of huge Tiger Sharks swimming directly at the camera but unfortunately, all you’re getting is footage of Tiger Sharks swimming in the opposite direction. Marine life is our speciality, especially sharks, we know sharks extremely well and we can ensure you get what you need, sometimes that means taking a calculated risk but we’re prepared for that and we do it very well. She may be a great actress with a string of award winning performances on Broadway but can she swim? He’s a great presenter, delivers his lines in one take and is the consummate professional but does he panic in water deeper than in which he can stand? If you’re putting people in water you need to know they’re going to be at their best to do their job and we need to know they won’t be a risk to themselves or others on set. A lot of people are uncomfortable, even afraid in marine environments but that’s fine, if you have a frank and honest conversation with them first, we can then assess and if needed, train your talent to handle anything that comes their way on the shoot. It’s no secret that many production companies, even the bigger ones, scrimp on their budgets for underwater shoots, even cutting corners which could put people at risk. The idea of approaching the local dive club and asking someone there to film an underwater sequence will not only result in poor quality footage, it’s also illegal! (See the HSE guidelines and overview here). Before you settle on your budget, you need to talk to people with experience of handling underwater film shoots so you know what to expect and don’t fall foul of the law or even worse, someone getting hurt or killed, because you treated the underwater sequences as an afterthought. Our pricing is fair, honest and reflects the quality and safety of our work. If your other sequences are all shot in 4K, it’s fair to say you will want the underwater sequences to match and this may mean hiring cameras and/or housings and lighting to get the shots you need. Talk to us and we can ensure you get what you need with the right kit and include it in your budget. If you’re putting people in or near water, there is always a risk that someone may drown, of course, we’re here to minimise that risk but alongside bodily harm, water, particularly salt water and electronic equipment do not mix well to say the least! If you have underwater sequences in your production, ensure you, your talent, equipment and crew are suitably insured for any and all risks relating to this!